A leading provider of telecommunications and managed connectivity solutions, AireSpring offers services such as business VolP phone systems, SIP Trunking, business continuity, business Internet, SD-WAN and Unified Communications (UCaaS). 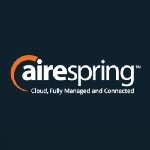 AireSpring maintains network interconnections with over 16 US networks and all major carriers. AireSpring's nationwide managed services provider and network operator status allows it to tie together multiple services and carriers nationwide into a single network and one bill. AireSpring's nationwide MPLS meshed network provides customers a seamless, fully integrated solution from a single vendor. Using this robust local and long-distance network, AireSpring covers more than 95 percent of the United States market and processes over 30 billion calls each year. Rather than spend money on consumer advertising, AireSpring focuses on investing in technology such as proprietary order provisioning and billing systems, passing on significant savings to customers. To further ensure that customers receive the best service possible, AireSpring assigns an individual customer support representative to each dedicated account and publishes a support escalation list that goes all the way up to its CEO.